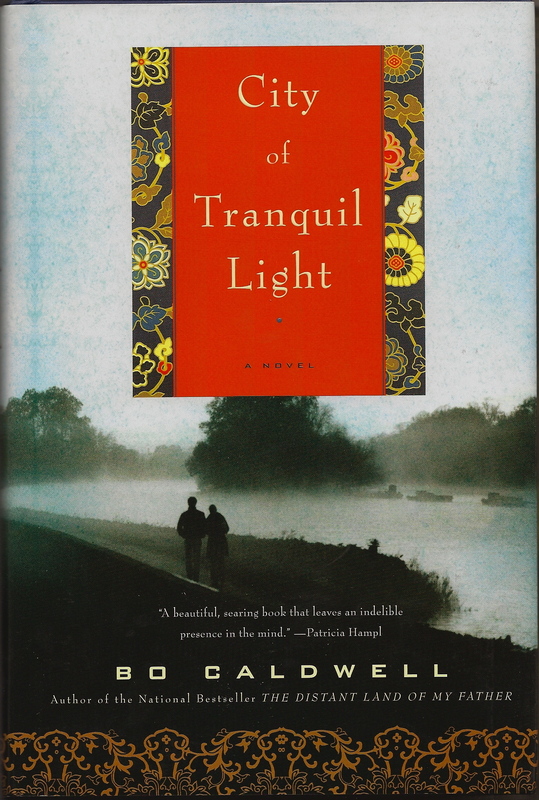 I recently read City of Tranquil Light by Bo Caldwell (Henry Holt and Co.). In this novel, the elderly widower Will Kiehn is looking back over his life. As a young man, he felt called to go to China as a missionary. There, he met and married fellow recruit Katherine Friesen. Will preached, Katherine did medical work, and together they experienced the formation of a sizeable Christian church in Kuang P’ing Ch’eng (meaning, City of Tranquil Light) and its outlying regions. They also experienced personal struggles and the trials of their adopted country: famine in 1918-22, civil war in 1925-28, the disintegration of an ancient civilization under imperial rule and China’s massive shift to communism. Interspersed with Will’s backward look is Katherine’s voice, via her diary entries. The use of alternating voices – one with its perspective in the moment, the other through the gaze of memory – makes the story a kind of conversation as well as a telling. It’s a format that adds momentum to a story that feels — in spite of dramatic elements — quiet, gentle, and measured. (As one might expect from an older person’s recollections). It also deepens the thematic resonance of the book. With that said, let me step back a little into my own context. City of Tranquil Light is a missionary story, and I grew up with missionary stories – in books and Sunday school papers and magazines, from the pulpit, in conversations all around me. They were stories of sacrifice, difficulty, and gut-wrenching inspiration. Missionaries were the heroes of an evangelical Protestant childhood; they were the Supermen and Superwomen of our world, and their ocean-crossing the equivalent of the costume change in the telephone booth. I don’t mean this cynically; it’s how things appeared to us. Most formative for me was the much publicized event in January, 1958 in which five missionaries were killed by the then-called Auca Indians, an event that spawned a raft of books. Shadow of the Almighty: the Life and Testament of Jim Elliot by Elisabeth Elliot was especially influential for my generation. I recall, as well, the influence of Isobel Kuhn and her Green Leaf in Drought-Time, and the poetry of Amy Carmichael. In my 20s, I found myself both startled and encouraged by a warts-and-all biography of Kenneth Strachan (Who Shall Ascend: The Life of R. Kenneth Strachan of Costa Rica), also by Elisabeth Elliot. Perhaps the warts – the ordinary rather than the saintly – had been there in earlier readings but I’d been unable to see them. At any rate, by my young adulthood, I – and seemingly the wider culture as well – needed a more nuanced approach. Certainly the super-person sheen of “missionary” is gone. The word has become loaded, even unpleasant for many. Our awareness of the global community has shed some of its notions of exoticism and (I trust) its colonialism. And, I realize, it’s been many years since I’ve read a book in the missionary genre. — Oh yes, there was that scorcher of a novel, Barbara Kingsolver’s The Poisonwood Bible, not exactly flattering to missionaries, but certainly underlining how complicated such endeavours can be, as they partake of the complicated histories of both sending and receiving countries. Following this exchange, one of Will and Katherine’s Chinese friends and colleagues, Lao Chang, steps forward to defend the couple as “teachers of virtue…. They have brought us great good news, and for this we are in their debt.” There were good people among them, Caldwell is showing, and among those, these two – Will and Katherine. They have their faults, but Will and Katherine extend respect and grace to one another, and we feel this from the author to her characters as well. The portrait Caldwell draws has a noble bearing, and soft edges. If this pulls the book towards a narrative of sainted, sacrificial missionizing I can’t trust as much as I did as a child, it also pulls towards something else I find very compelling: a lovely meditation on love. There’s the love of Will and Katherine for one another. Will’s voice feels quite formal, even stiff sometimes, but his emotions do come through. Katherine’s voice is freer, more intimate, as suits a diary, though it also reads more formally than a contemporary diary might. In spite of their differences (and the small, appealing secrets they keep from each other), they forge a strong bond. We passed our compound on the right, and the farther away we got, the more my heart seemed to tear. The road turned sharply south and I strained to see our home one last time. Then I saw the city wall, just as I had seen it hundreds of times when I returned from every possible direction, at every odd hour of the day or night. I remembered the first day we had come to Kuang P’ing Ch’eng, and how its name had led me to expect a graceful city bathed in a gentle glow. It had not appeared like that at first sight so long ago, but as I looked back for the last time, that was exactly how it looked: beautiful, and filled with grace. I stood frozen at the window, staring out at the bodies of fourteen northern soldiers. A wave of raw anger ran through me, a rage unlike anything I had ever felt. I had been taught since I was a small boy to abhor violence, and that the use of force against anyone, whatever the reason, violated God’s word. As an adult I had honored that belief and made certain that our compound stocked no ordnance whatsoever. But at that moment my convictions fell away. Nearly everyone I loved on this earth was in that room and I knew that had I had access to a weapon of any sort, at that moment I would have used it without hesitation. I breathed; I forced my attention to God and asked Him to direct my thinking, and my emotions quieted enough to think more rationally…. The Mennonite angle will make this book interesting to Mennonite audiences, though it may also provoke some tiny quibbles. Will mixes up the details of his Mennonite heritage in Prussia and Russia. He also says that “the practice of the Mennonite church was baptism by full immersion.” Of his group yes, but not of many Mennonites. But I’ve meandered – or jumped about – long enough. I was invited to receive this book from the publisher, Henry Holt and Co., because of its Mennonite connection I believe. In accepting the invitation, I made it clear I would feel under no obligation to review it, or by implication, do so favourably. But I enjoyed the book enough to also make it a pleasure to talk about and recommend here. This entry was posted in Books, Mennonite, Reading and tagged Bo Caldwell, City of Tranquil light, Henry and Nellie Bartel, missionaries, Paul and Ina Bartel, Peter and Anna Schmidt Kiehn by doradueck. Bookmark the permalink. Great post with wonderful content. You may be interested to know about a new book which contains transcriptions of some of Jim Elliot’s spoken messages prior to leaving for the mission field. May God bless you and your service for Him. Thank you for writing, and for the information. As I say in the post, Jim Elliot’s life was significant for many in my generation. I came to realize that Elisabeth Elliot didn’t serve us as well as she could have, however, in presenting a too glowing picture of Jim. When I read the published journals of him many years later, I could see what had been left out. — All the best with your book. I’m sure it makes a great difference to have known him personally. Loved your meanderings, Dora. You read with open mind, heart, and spirit. I also remember the Auca Indians and the Eliots. We had our own missionary to Ethiopia in our congregation, and I always loved hearing her stories. I linked to your review in my own blog post on this fine book. Thanks Shirley, also for the link. I really liked your review, at your site, which of course I will also see in the Christian Century (one of my favourite magazines), when my Oct. 6 issue arrives. Especially the line “quietness as a form of passion and simplicity as beauty.” An apt description indeed.